Control arms "hold" front wheels. Most cars have two control arms in the front suspension. Often they are called lower control arms. Some cars (e.g. Honda Accord) and many trucks have four control arms, two upper and two lower arms. What does a control arm do? It connects the frame or body of a car to the assembly that holds a front wheel. This assembly is called a steering knuckle. 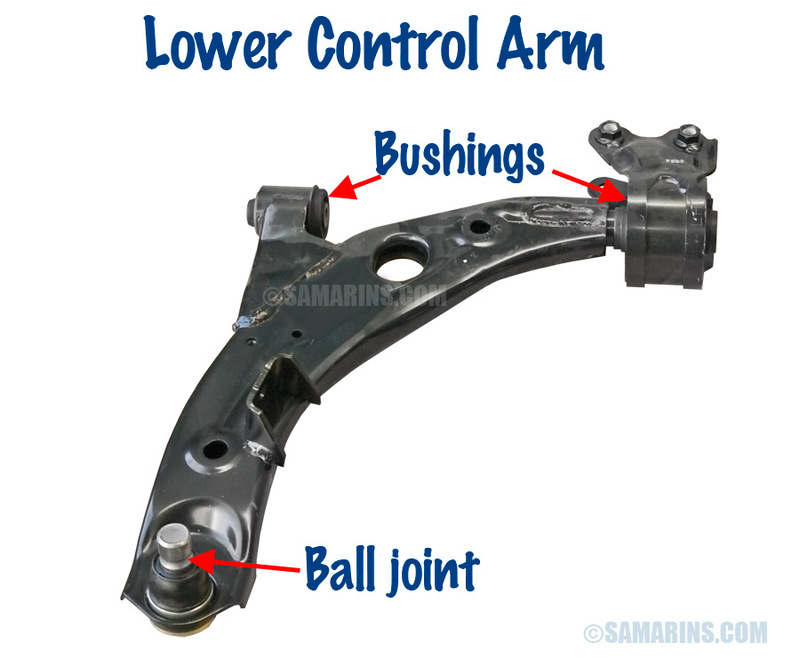 Control arms are connected to the frame or body of a car through flexible rubber bushings, called control arm bushings. This allows a control arm to swing up and down as front wheels roll over bumps and potholes. The outer end of a control arm has a ball joint. 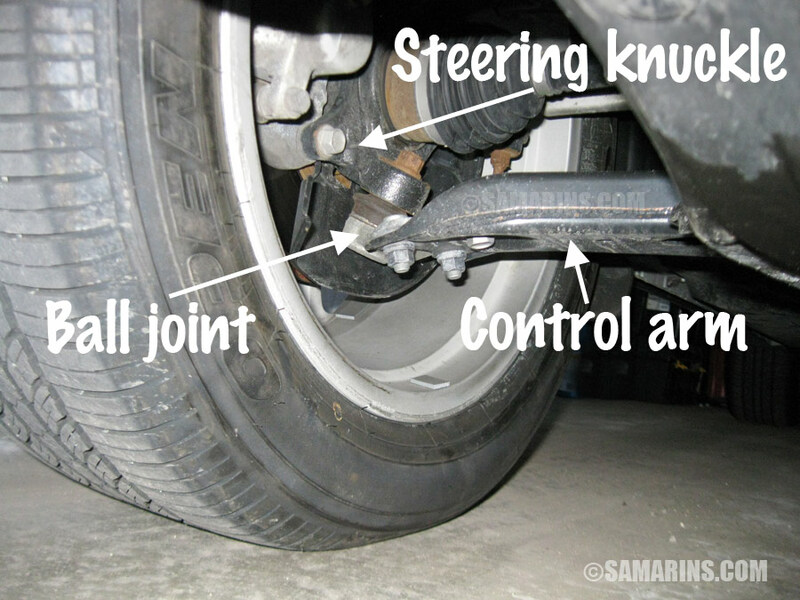 In some cars, a ball joint is bolted to or pressed into the control arm and can be replaced separately. 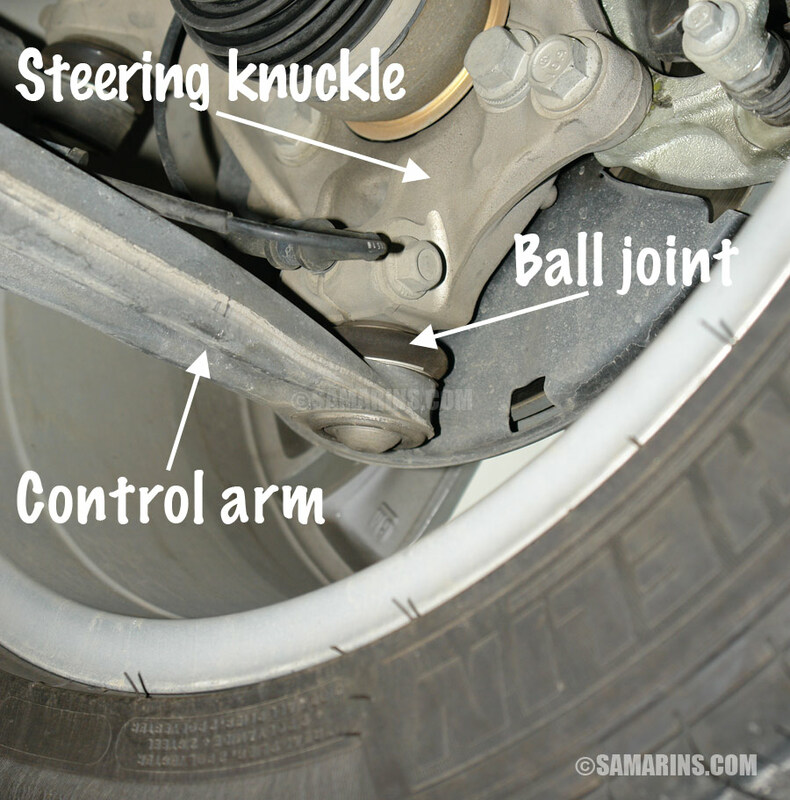 In others, a ball joint comes with a control arm as one piece. Control arms have a very important role holding both front wheels on the road. If a control arm is excessively worn, damaged or bent, the vehicle is NOT SAFE to drive. There are a few reasons why a control arm may need to be replaced. 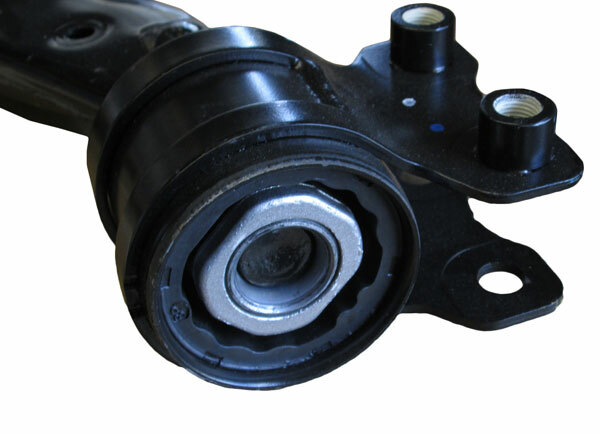 A worn-out ball joint that cannot be replaced separately is one of the most common reasons. A ball joint is an extremely important component. If it wears out, the car is unsafe to drive: the front wheel can separate from the lower suspension causing the vehicle to lose control. 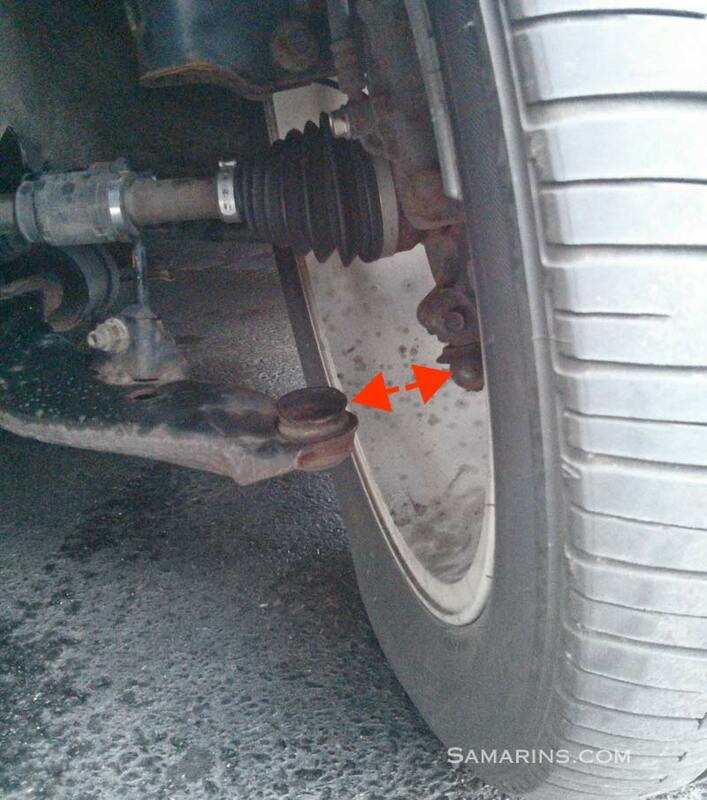 In the photo above, the ball joint has separated while driving, although the owner was lucky that it happened at a slow speed. If this had happened on the highway, the outcome could have been much worse. Worn out or torn control arm bushings is another reason a control arm may need to be replaced. In some cars, control arm bushings can be replaced separately, but it involves more labor and could cost more. 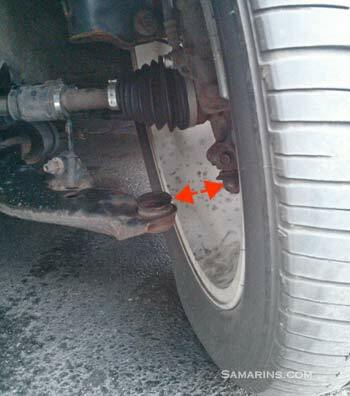 For this reason, the whole control arm is usually replaced if the bushings are worn out. The control arm is also the most common part that bends in a collision involving one of the front wheels or after hitting the curb. A bent control arm must be replaced. Control arms, as many other suspension components, cannot be properly inspected at a drive-through fast-lube place. The only way to inspect control arms is when the vehicle is lifted on a hoist. This is what happened to the owner of the vehicle in the photo above: for the last year, he visited only a fast-lube shop and they didn't catch a worn-out ball joint earlier. Are there any symptoms of a bad control arm bushings or a ball joint? You might hear some popping or clunking noise when driving over bumps, or when accelerating and decelerating. In some cases, a car may feel unstable and "wander" during braking or when driving over rough surfaces. Often, however, the symptoms might not be noticeable at all. This is one of the reasons why it is important to have your vehicle inspected at least once a year in a repair shop by a skilled mechanic with the vehicle lifted on a hoist. For the US recalls: NHTSA Recalls, have your VIN number ready. For Recalls in Canada: Transport Canada website. Replacing a lower or upper control arm can cost from $160 to $390 for one arm. It's not necessary to replace both, left and right arms if one is bad. Often, however, if one arm is worn out, it's reasonable to expect that another control arm will likely need replacement soon. In this case, it's makes more sense to replace control arms on both sides at the same time. 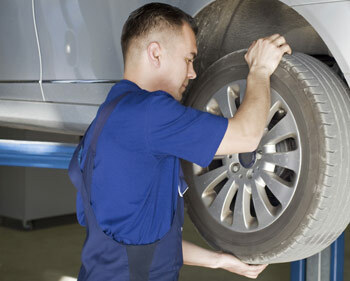 After one or both control arms are replaced, the wheel alignment procedure must be performed (another $60-$120). Do stabilizer bar links need to be replaced whenever a lower control arm is replaced? Stabilizer bar is usually connected to the lower control arms via stabilizer bar links. Sometimes, a nut that holds the stabilizer bar link could be seized and cannot be removed without damaging the link. In this case, your mechanic might recommend replacing the stabilizer bar links as well. In most cars, the links are not very expensive and doesn't require any extra labor when the control arm is replaced. Can control arm bushings be replaced separately? In some cases, worn out control arm bushings can be replaced separately. However, control arm bushings need to be pressed in with a special tool or press, which takes some time and adds the labor cost. Is a control arm easy to replace at home? On the difficulty scale from 1 to 10, replacing a control arm is 7 or 8. In the shop, it takes about 1-1.5 hours to replace one control arm. Aftermarket parts are cheaper, but we had seen many cases where aftermarket control arms wear out prematurely. For example, when one of the control arms became noisy in our Mazda 6, the dealer didn't have an original part in stock. Pressed for time we went to a small shop. The part was delivered within an hour; It had no box or label. According to the mechanic it was most likely manufactured in China. Within 2.5 hours the repair was completed for $230, half of what the dealer quoted us. In 8 months, however, the same control arm became noisy again. This time we didn't want to take a chance and had a local Mazda dealer replaced it with an OEM part. Since then, this Mazda 6 lasted for another two years with no troubles before we traded it in. 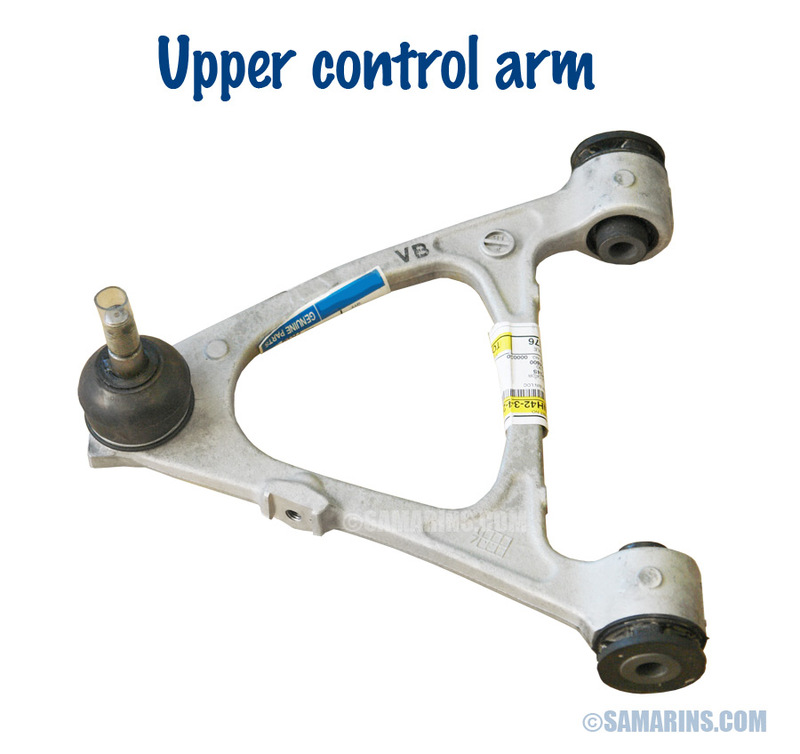 Our advice, control arms are too important for the safe driving, especially in heavy SUVs and trucks. Use OEM parts or at least top-quality aftermarket parts.